Offering you a complete choice of products which include stainless steel bird spikes and plastic bird spikes. Stainless Steel Bird Spikes are 100% effective and common deterrent devices used to stop birds from perching just about anywhere they wish. The word steel bird spikes may sound so dangerous but they really are not. They are just intimidating irritating, and uninviting device that home and business owners can place on their roof peaks and edges to deter these pest birds away. The steel bird spikes are long enough but not sharp, yet these things will make perching of birds so difficult that they will just go away and look for other places to roost and perch. If problem places are all installed with stainless steel bird spikes, these birds will eventually go back to where they are safer and secured—up in the trees and the forests. Stainless Steel Bird spikes are gentle for the birds and thus could be used openly and freely to deter bird pests. We are the largest suppliers and manufacturers of Stainless Steel Bird Spikes in India. Prompt’s Stainless Steel Bird Spikes are designed and styled for effective performance, anywhere they may be placed and installed. Thus, it can truly back the claim of round the clock pest bird protection. More importantly, stainless steel bird spikes are rated for upto 30 maintenance-free years, which can go better and last a lifetime if properly installed. Thus, people will never have to shell out more money for maintenance and replacements of things that these birds can damage. Bird Spikes reduces huge spending of many property owners for cleaning supplies and tools as well as fixing the damage caused by these birds and . Bird spikes are made from high-grade stainless steel, last for almost 30 years on the establishments, and preserve their effectiveness. Stainless steel types of bird spikes are UV stabilized poly-carbonate (virgin grade) based that are spiked with chromed stainless steel and comes in 1-foot sections. The spikes are shatterproof and extremely light weight. Each section of steel spikes contains 20 blunt tips that do not hurt bird or humans. While it is sad to keep birds at bay, it is even sadder and even impractical to let these pest birds damage human properties. Either responsible owners take charge and keep them in bird houses or they’ll be repelled from perching on neighbors’ houses and building structures. Whichever is the case, it is best to be ready; install Prompt’s stainless steel bird spikes now! Plastic Bird repellent spikes 100% effective maintenance-free permanent solution to pest bird infestation. They prevent pest birds from landing, perching or roosting wherever they are used. Bird control spikes create a physical barrier. 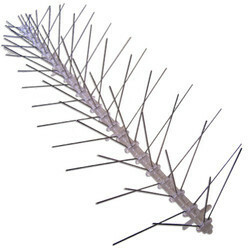 They are also known as polycarbonate bird control spikes.Plastic Bird spikes are used on structures worldwide to keep pest birds from roosting and nesting Install bird control spikes on rooftop edges, ledges, window sills, chimneys and other surfaces where pest bird roosting and nesting is a problem. Bird spikes are a guaranteed way to deter pest birds from landing on your property, eliminating damage and liability.Plastic bird spikes are used to stop large pest birds such as and crows from roosting on ledges and other surfaces. 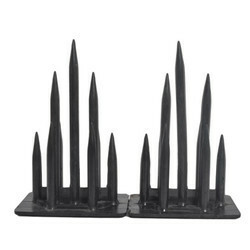 Plastic spikes are not harmful they simply prevent pest birds from landing.